The 300x600, 600x300, 400x400, 600x600 and 600x900 product range comprises air supply units for displacement ventilation, and is designed for embedded installation in wall. Siv-inn Inlaid features a duct, box and front grille. Duct height can be adjusted as stated in table 2. The front grill is available in 5 dimension options, and is easily assembled with the screws supplied. Siv-inn Inlaid is made of solid steel plate. 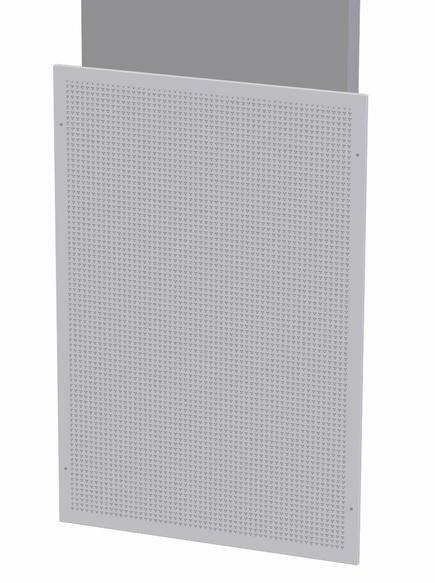 The front panel is fitted with a gasket and comes in a RAL 9003 - gloss 30 finish as standard, while the box and duct are in a galvanised steel-plate finish. Reinforced frontpanel is available on request. Groove dimensions for box are BK x HK + approx. 5 mm. The height of the connecting duct is adjustable (see table 2, dim. L). Duct height is adjusted and sealed prior to installation in wall. NB! If the unit is attached directly to the studding, the moulding should be fitted after the wainscot (see fig. 3). The front panel is fitted by using the screws supplied. Please also see the instructions.